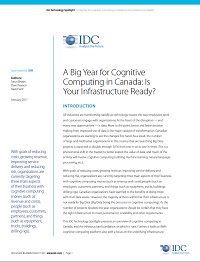 A Big Year for Cognitive Computing in Canada: Is Your Infrastructure Ready? Cognitive systems have come a long way and can help manage large increments of structured and unstructured data. IBM has designed and developed enterprise-grade cognitive platforms to help Canadian organizations discover what’s possible and reap the rewards of digital transformation. Download this IDC Technology Spotlight for an overview of cognitive computing in Canada, and why cognitive computing platforms are right for you.